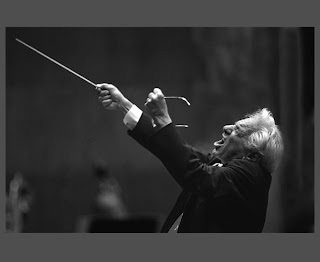 I have always been a fan of Leonard Bernstein. His music is unlike anything before or since his time. And his conducting, my goodness. It is said that he felt as though one of the conductor's jobs was to guide the audience's emotional reaction to the music by how he or she conducted. Unfortunately, this school of thought did lead to some contrived movements which, at times, didn't express much of anything to the people playing from his cues. Who am I to judge Bernstein's conducting, though? When you watch him, he takes you past the music and into an emotional place where few conductors can truly take you... and, I've only seen him on video. I can't imagine what it was like live. Something else that would certainly add to this potential Hollywood blockbuster is the subject of a fantastically rivoting piece in The New Yorker. During the long dynasty of J. Edgar Hoover at the Federal Bureau of Investigation, Leonard Bernstein was a person of considerable interest. His file has not yet appeared in the F.B.I.’s Electronic Reading Room, but they did furnish a copy of the 800 page file to The New Yorker's Alex Ross. 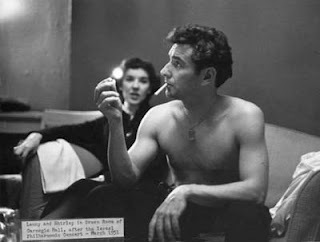 J. Edgar's comrades began tracking Bernstein’s "left-wing activities" as early as the mid-nineteen-forties. The first serious inquiry came in March, 1949 when President Truman and Chaim Weizmann, the first President of Israel, were scheduled to attend an event at which Bernstein was to conduct. 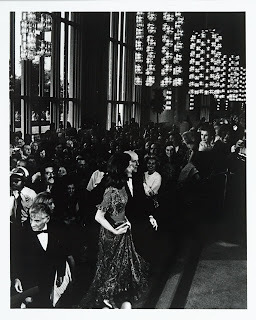 The inquiries continued for decades eventually rising in crescendo around Jackie Kennedy Onassis' commission of Mass for the opening of The Kennedy Center in Washington, DC. The White House, fearing that Bernstein was plotting to “embarrass the United States government,” was warned to steer clear of “Mass” at all costs because of the left-wing elements. They certainly did. Check out the The Bernstein Files by Alex Ross in The New Yorker. This three-part multimedia series tours the political workings of this major musical personality. It is sure to please. Ross even promises that patient readers will be rewarded with a cameo by Ginger Rogers. I wonder who they're watching, now? Alex Ross has given the third and final installment to The Bernstein Files: Bernstein in the Nixon Tapes. These 8 audio excerpts from the famed Nixon tapes contain specific discussion about Leonard Bernstein. If you're not a fan of curse words I would push on because there are a few.